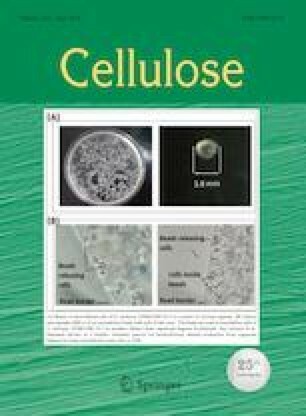 A method was developed for the high-yield preparation of cellulose nanofibers (CNFs) using glycerol and a small quantity of sulfuric acid with a colloid milling mechanical dispersion. The glycerol together with a small quantity of sulfuric acid was employed to break hydrogen bonds between cellulose fibrils, after which the excessively swelled cellulose bundles could be easily disassembled to nanosize by a simple mechanical treatment. Reaction conditions, including the amount of sulfuric acid, the temperature and the preferred acid treatment time, were optimized to be 0.64% w/w sulfuric acid (based on the whole reaction system), 100 °C and 2 h respectively. Under the optimized conditions, CNFs with a width less than 100 nm and a length of several microns were obtained from various raw materials with high yield (above 85%), high crystallinity and an average degrees of polymerization (DPv) of 200. We are grateful for financial support from the National Natural Science Foundation of China (Grant No. 31870565) as well as project funding from the Natural Science Foundation of Jiangsu Province (BK20181397).